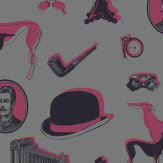 Flock wallpapers to fall in love with. 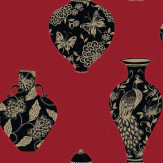 Stunning ancient vases of the Orient, statement pieces of porcelain - showing in black and metallic gold on a Red background. Other colour ways available. Please request a sample for true colour match. Paste-the-wall product. 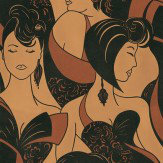 A beautiful sensuous design showing elegant women melting into each other. 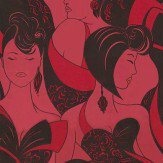 Rich burgundy red velvet flock, scarlet red gloss and a matt raspberry pink background. Available in other colours. Please request sample for true colour match. Richly detailed Edwardian inspired black and red hats, with velvet touch black glittery flock on a pale candy pink and white striped background. Available in other colours. Please request sample for true colour match. A sumptuous pearlescent oyster shell ground is the backdrop for this naughty but elegant Basque. The design is printed on a soft and very tactile – paste-the-wall paper using high quality inks, luxuriant flocks, fabulous glitters and lustrous micas. Shown in sugar pink. Please request a sample. 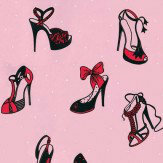 Richly detailed high heeled black and red shoes, with velvet touch black glittery flock on a sugar pink background with tiny white dots – intense and gorgeous. Available in other colours. Please request sample for true colour match. 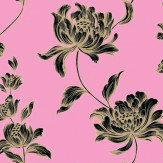 A magnificent floral, vigorous and bold with just a hint of fragility - showing in gold and black on bubblegum pink. Other colour ways available. Please request a sample for true colour match. Paste-the-wall product. 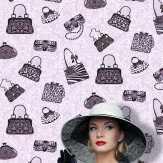 ‘Ladies Day’ Lavender ground embellished with luscious black flock with a hint of glitter. The design is printed on a soft and very tactile – paste-the-wall paper using high quality inks, luxuriant flocks, fabulous glitters and lustrous micas. Pattern repeat is 64cm. Please request a sample. Never brown in town – but de riguer for a weekend at the country pile. The design is printed on a soft and very tactile – paste-the-wall paper using high quality inks, luxuriant flocks, fabulous glitters and lustrous micas. Please request a sample. 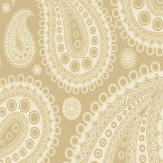 Here our Paisley design is coloured in mellow tones surrounded by creamy flock to create a light, bright and glamorous ambience. The design is printed on a soft and very tactile – paste-the-wall paper using high quality inks, luxuriant flocks, fabulous glitters and lustrous micas. Please request a sample. Pattern repeat 64cm. 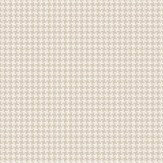 A hounds tooth check straight from Savile Row, Soft creamy flock printed onto a pale cream background. The design is printed on a soft and very tactile – paste-the-wall paper using high quality inks, luxuriant flocks, fabulous glitters and lustrous micas. Please request a sample. 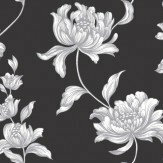 A magnificent floral, vigorous and bold with just a hint of fragility - showing in white and silver on black. Other colour ways available. Please request a sample for true colour match. Paste-the-wall product. 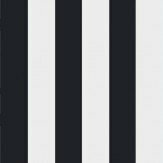 A real VIXEN – pure white grounds with bold black Basques. The design is printed on a soft and very tactile – paste-the-wall paper using high quality inks, luxuriant flocks, fabulous glitters and lustrous micas. Please request a sample. 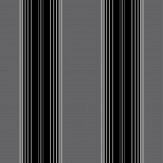 An old standard in the ‘stripe’ world, done here with black flock on a elegant dark grey background. The design is printed on a soft and very tactile – paste-the-wall paper using high quality inks, luxuriant flocks, fabulous glitters and lustrous micas. Please request a sample. 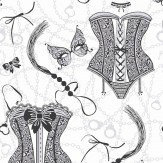 Free pattern match. A fun, quirky collection of beautiful, rich, velvet flock wallcoverings with fabulous glitter and sparkling mica effects, in a range of on trend designs, including a stunning tartan check, paisley motif and the delightful Bertie design, with its Edwardian motifs. Paste the wall collection. New special offer price - was £72.00!! 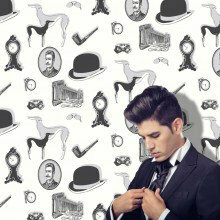 A stunning new collection called The Bloomsbury Collection by Opus Muras. Including a magnificent floral with just a hint of fragility, 44 Bedford Square - Showcasing ancient vases of the Orient, statement pieces of porcelain that command attention, a sophisticated black and white stripe. 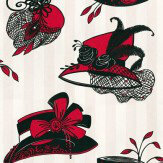 A beautiful toile in many colour ways. All Paste-the-wall products which makes it easy to apply and remove.